It had been so long since my last visit to sunny San Diego, that I essentially had to start all over. One aspect of the experience that truly surprised me though was the culinary side of the city. From cafes and restaurants to hipster-filled breweries, the city has truly come into it’s own. I enjoyed many delicious meals, snacks and drinks, but here are a few that are truly not to be missed. Located just 17 miles from the Mexican border, there has long been a near constant sharing of cultures, languages and food between San Diego and Mexico. Waves of immigration over the decades has created a food scene that has strong roots in traditional Mexican flavors and what may be at the heart of that experience, other than avocados, is the taco. When asked, San Diegans suddenly drop their laid back veneer when the topic of Mexican food comes up; everyone seems to have very strong opinions on the matter. Luckily, I seriously doubt many of them are wrong when it comes time to identify the best tacos in the city, the options are all fairly amazing. One though in particular stuck out in my mind and the experience of enjoying a robust lunch at the restaurant ¡SALUD! in Barrio Logan was one of the many culinary highlights of my trip. Housed in a heritage 1910 building, the restaurant is pure Southern California from the tattoo inspired murals to the pinstripe car hood on the wall. Barrio Logan has a long and colorful history making this delicious taco shop the perfect addition. With a traditional taco for any taste the highlights are the Birria, Al Pastor, Carnitas, Carne Asada and the Barrio, which is Carne guisado topped with frijol nopal & sour cream wrapped in a hand pressed flour tortilla. A true local took me here and honestly, it really is one of the best in the city and probably the country. 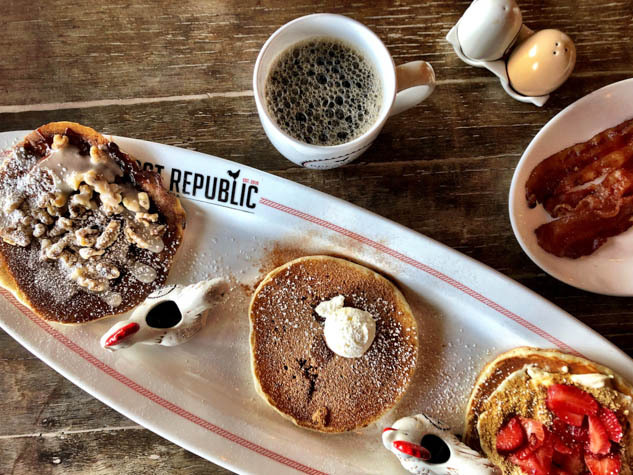 With several locations around the greater San Diego region, Breakfast Republic is easy to find and make for a great meal any time of day. The menu is fun and creative with some delicious variations on traditional breakfast fare, perhaps best seen in their pancake selection. With so many different options, I elected to go with the Pancake Flight, which allowed me to try three different versions. After much deliberating, I went with the Churro, Cinnamon Roll and Strawberry Cheesecake Pancakes, with a side of Jurassic Pork (candied bacon) for good measure. Whichever location you decide to visit, just make sure you enjoy a great breakfast here at least once. One facet of the culinary side of San Diego that surprised me is the incredible beer scene. In fact, with more than 130 breweries, San Diego has quietly become the beer capital of America. It’s a beverage locals take very seriously and you can find local brews on tap at almost every restaurant in town. For the perfect introduction into San Diego’s brewery culture though, there’s nothing better than a Brew Hop Tour. Started by wife and husband team Summer and Larz, the couple decided to turn their passion of the beer industry into a fun and immersive tour Whether you’re a beer aficionado or just enjoy drinking a pint or two, the tours are tailored to your interests. Each tour is private and customized for you and your group, which means the best possible experience as you are driven around town in style. Feeling like a true VIP, the evening spent with Summer exploring the breweries around San Diego and learning more about this incredibly interesting industry was a highlight of my time in San Diego. More than just enjoying plenty of samples, it was the perfect crash course into everything that has made San Diego such an important beer city. Have you been to San Diego? What were your favorite foodie experiences? A luxury adventure traveler at heart, Matt Long shares his experiences with thousands of readers every day through his travel blog, LandLopers.com. As someone who has a bad case of the travel bug, Matt travels the world in order to share tips on where to go, what to see and how to experience the best the world has to offer. Matt is a Washington, DC based travel writer/photographer and has been featured on many other web sites and publications including BBC Travel, CNN GO, Huffington Post, AFAR Magazine and National Geographic Intelligent Travel. His work is also syndicated on the Flipboard and Pulse apps. Follow Matt on Facebook, Instagram, Pinterest, Twitter and Google Plus.